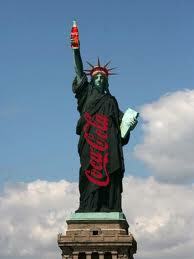 NYC BAN ON LARGE SUGARED DRINKS! Nanny Bloomberg strikes again. This morning I stopped into the Mexican bodega across the street for a breakfast sandwich (fatty, high-calorie bacon, egg, and cheese) and the owner looked extremely pleased to be in the process of replacing the ‘B’ on the window with an ‘A’. For those who don’t know, the NYC Dept of Health now grades restaurants, delis, and bodegas with a letter grade based on cleanliness, A through C. Most New Yorkers, tolerant of paternalistic government, probably don’t mind and even welcome it. They probably believe the city is giving them information they need to make choices. As you can imagine, I never liked the idea of public bureaucrats showing up and grading an establishment and then forcing them to post this grade on the front window. If a place is dangerously unsanitary, then I don’t mind the local government having the authority to shut it down. Yes or no. But this grading system reeks of nanny statism, and could only hurt businesses, not help. Of course, you hear and read the usual responses from people willing to lay down and take it because “something needs to be done” about “a real problem”. This will make us healthier, and that’s a good thing, they say. I’m really wondering when this will reach a tipping point with people. Starbucks is extremely popular here (sometimes you can be inside a Starbucks and see at least one other Starbucks out the window) and if the city keeps screwing with people’s coffee, they might start to rebel. We’ll see. Bloomberg has also recently attempted to ban smoking in people’s own apartments, which is one of those things many of us warned about when these bans started, and were laughed at. That will never happen! Yeah, well, who would have thought that Venti Caramel Macchiato would land you a ticket from the sugar police? In the media stories I read, I notice attention is given to the counter-argument involving “choice” and restrictions on “personal freedom”. That’s all well and good, but I never hear mention of the rights of property owners. Personally, I don’t smoke and don’t like cigarettes. I don’t like walking into a bar and getting it all over my clothes. But I also don’t like the idea of the government telling a private business which LEGAL products can be consumed in their establishments, or that those makers of LEGAL products have to display disgusting images on their packages. These are the property owners to which little attention is paid. And if you’re a coffee store, why can’t you sell coffee in whatever size container people want to purchase? Same thing for the makers and sellers of these other products — their rights are rarely considered, and they have just as much right to legal choices as does the consumer. I also find it somewhat ironic that many of the New Yorkers who are always saying “it’s a good thing” when it comes to these health choices are avid recreational drug users. Will the city start arresting pot smokers in their apartments? Probably not. But take away New Yorkers’ liquor and recreational drugs, and then you’d probably have a revolt. I always thought New York should be the freest city in the world, but that distinction probably goes to Hong Kong. After all, New York is the largest and most vibrant city in what is supposedly the freest country in the world. Except that it’s not anymore. And when Bloomberg goes on TV and says “We’re simply forcing you to understand”, then yeah, I guess I do understand. I just wonder when everyone will and say “enough”. I still can’t post replies onto your blog pages. So, please post this. Thanks. One must wonder when someone will force HIM to understand such things as jurisdictional boundaries, American jurisprudence, our Constitution, and American principles of freedom. Oh, silly me. If he understood those, then he wouldn’t be a Democrat. What an arrogant pig. Telling anyone how to do things. Maybe if he could make himself perfect then he can come and talk with me. I will not hold my breathe on that one. I’m so sick of people trying to tell me how to live my life. I’m 56 years old and besides my mother and father raising me I didn’t need help feeding myself or dressing myself, I suppose that will be next. Maybe I’m picking the wrong fabric or something. This is absolutely nuts and really why do people put up with it???? ?